Our afternoon's visit to the plot was shorter - due to our silly tradition of moving the clocks back. I don't know about you but I hate it when it is dark at what in summer still seems to be late afternoon. I don't think winter would be half as bad if it stayed light a bit longer. It's pitch black now and it's only just after 5 o' clock! Anyway back to the point - the afternoon was shorter but definitely sweet - the sun was shining and as I weeded I was serenaded by the buzzing of busy bees - both bumblebees and honey bees. Now that was a surprise so late in October when I expect the bees to be tucked up in a nest or hive. The objects of their desires were the borage plants that I grew from some seed kindly sent to me by Bilbowaggins from Bag End. 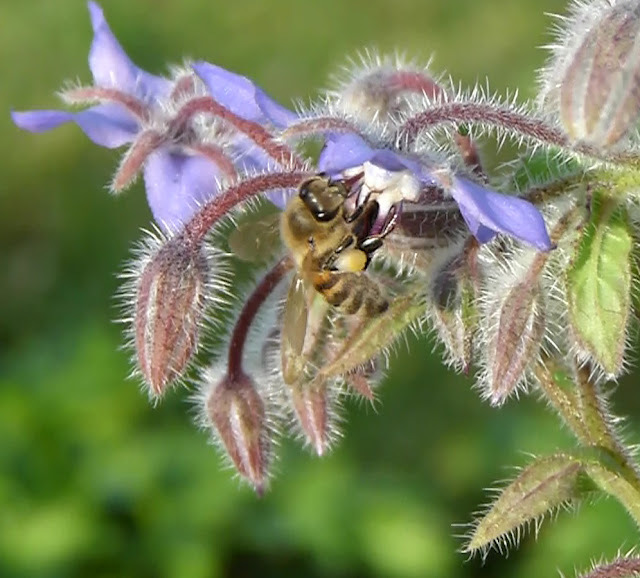 Borage is often called bee's borage as bees just love it and for them to be able to browse the small but beautiful blue flowers so late in the year is a real bonus - so Bilbo my bees thank you. The bees were whizzing from flower to flower and the only way I managed to get a photo was to shoot a piece of video and grab a frame. Even then most of the video clips were beeless. The photo below was really all I managed. Technically borage is an annual herb with edible flowers. I haven't really got into eating flowers so I can't tell you what it tastes like but apparently oil extracted from the flower seeds have the same properties as evening primrose oil. Despite it being an annual I won't be without borage next year as already some of the self sown seeds have germinated and grown into young plants. The bees will be happy about that and so am I. So will the dahlia tubers survive this winter? For several years we had left our dahlia tubers to over-winter in the ground. 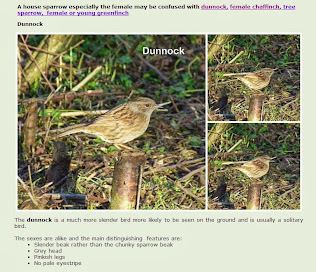 Our method of over-wintering is explained on my website here. Despite gardening on a heavy clay soil our storage method had been successful with hardly any loss of tubers at all. That is until last winter. Last winter was exceptional and resulted in us losing most of our dahlias. I’m not too sure that we would have had any more success if we had lifted the tubers as other gardeners reported losses despite lifting and storing. 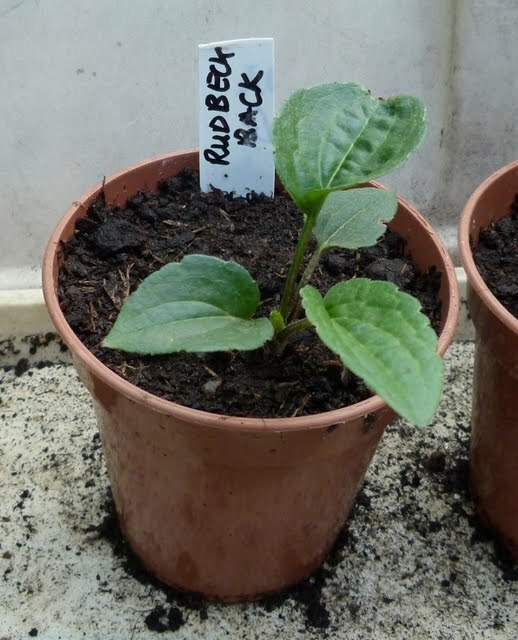 Anyway I decided rather than buying new tubers I would attempt growing some new plants from seed. 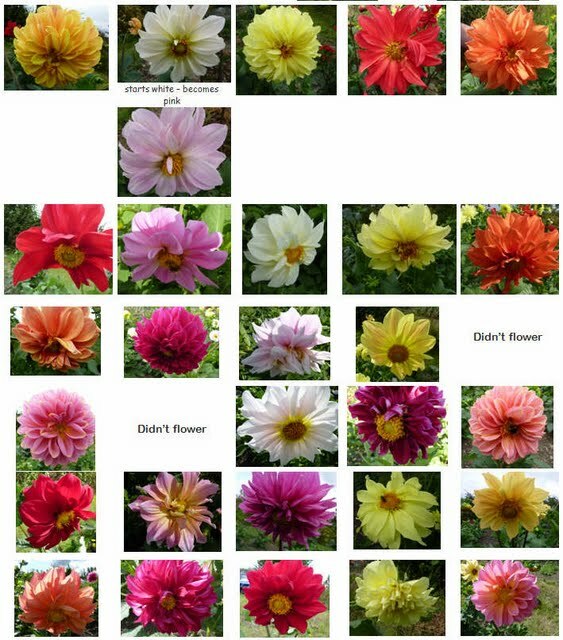 I bought a packet of Giant Hybrids Mixed and ended up with 30 young dahlia plants. These were planted out on the plot in June but were very slow to grow - another victim of the really dry conditions. In July the first of the flowers opened but the rest followed very slowly. Eventually all except for a couple grew into decent sized plants and flowered. I was a bit disappointed that although there was a lovely colour range the flowers didn’t really look as I had expected.. I’m not sure whether this was down to the dry weather or not. Anyway we have decided to lift the tubers this year just in case we have a repeat of last winter. The tubers have been placed in the plot greenhouse onto some wire ‘shelves’. This allows air to circulate around them. 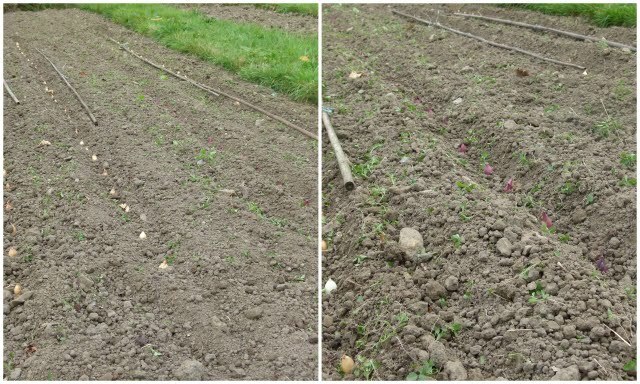 The tubers have also been placed stems pointing down so that moisture doesn’t accumulate in the hollow stems. Whether the tubers survive of not is in the lap of the gods but either way I think I’ll probably buy some different seeds to grow next year - maybe some pom-pom varieties which are really good as cut flowers - not too large. I need to make a public apology to Flamenco - one of our newly planted strawberry varieties. One variety of strawberry has produced most of our strawberry harvest this year - being newly planted this was more than expected. I have mistakenly attributed this harvest to Marshmello but this wasn’t the case. To those of you who keep telling us we are very organised this just goes to prove all is not what it seems. The error was noted as I was tidying the strawberry bed. I’d left labels by each plant which as the leaves grew had been hidden in the foliage. This revealed that what I thought was Marshmello was Flamenco and vice versa meaning our main cropper was in fact the ever bearing variety Flamenco. This does make more sense. Our total cropping was Flamenco 8.5kg, Amelia (late cropper) 0.5kg and Marshmarvel (an early cropper that seemed to produce a few fruits late on) 0.75kg. Marshmello (mid season) didn’t produce any fruits but we know that this is usually a good cropper and the late planting of the new plants would be the reason for this failure - I’m sure it will redeem itself next year. We’d also mixed up Amelia with Marshmarvel. The reason for the mix up was that I had drawn the rough plan from one side of the bed and Martyn had copied this onto the computer from another side. This also means that we had joint ownership for the mistake which is best all round. 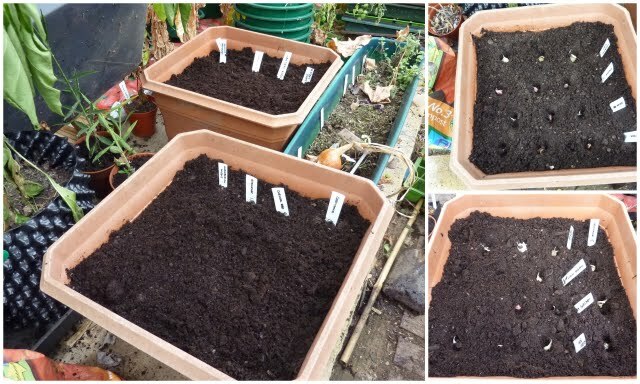 In case you're wondering I've also remembered to change the labels round on the potted on runners in our cold frame. If you remember we used a black porous biodegradable mulching fabric on the new strawberry bed. This was covered with straw and the entire bed netted to protect from birds. You can read about all that here. I removed all the netting in spite of Flamenco still having lots of unripe strawberries. I doubt whether these will make it to the table as most are being spoiled by the cool, damp conditions. 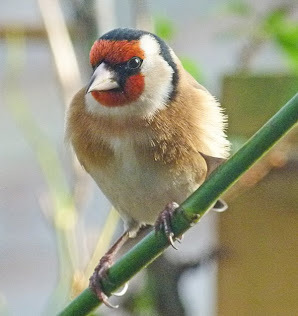 I’m happy to donate any that do turn reddish to any hungry birds. Once the netting was removed, all the straw was scraped off and consigned to the compost heap. I then tidied up each plant by removing any runners, that had managed to hang on despite my best efforts to cut them off, and any old or dead leaves. Normally I would cut off most of the leaves immediately after fruiting but this year I’ve been a little kinder to these young plants. Next year they’ll get the full treatment! The black mulch appears to have worked at keeping down the weeds - there were very few weeds managing to grow amongst the plants - just the odd bit of chickweed, speedwell or spurge pushing up through the holes alongside the plants and they could be easily pulled out. There has also been relatively little slug damage - I thought that the mulch may encourage slugs. I guess both lack of weeds and slugs could be put down to the dry conditions so maybe I need to give it another year before I draw any conclusions. The mulch is said to last up to 16 weeks - so far it has been down 19 weeks and is still in one piece - we laid it in mid July which was probably later than ideal. It will be interesting to see what happens in the next couple of weeks. I wonder whether covering the fabric with straw could have protected it causing it to last longer. I’m also a bit concerned that seeds from the straw have been left behind on the mulching fabric. I can’t really sweep these up so I wonder whether they’ll manage to grow in spite our best efforts at prevention. I’ll just need to try and keep on top of any that do. Oh, and I really ought to give a special mention to our alpine strawberries which have been providing us with tiny fruits for months now. I don’t want the plants to sulk and refuse to fruit next year! You may remember that this year I decided to try growing some cyclamen from seed. If not I posted about it here. You may also remember that at first I didn’t really expect any success and then as the seeds began to germinate my hopes were raised. 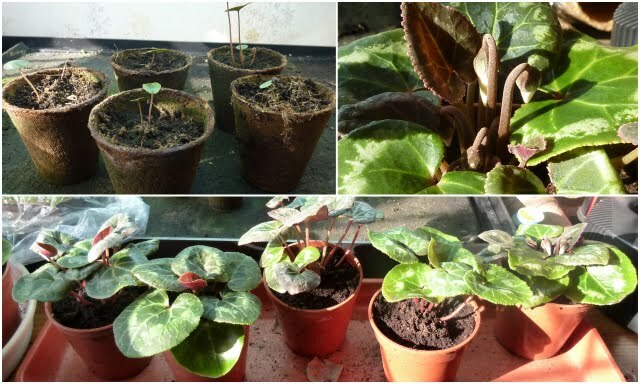 In the end all eight of the cyclamen Lazer seeds germinated and five of the cyclamen Coum. Lazer is a miniature variety that can be used as a pot plant or in theory planted outside in the garden.. It’s the sort that is on sale at the moment in garden centres. The sort that I bought last year after being assured it was winter hardy, the sort that fleetingly looked beautiful in a tub. There’s a photo of them in all their glory on this post. 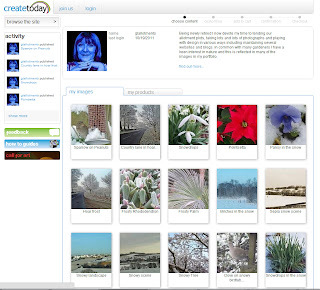 The beautiful display lasted short of a month as last December’s snow put paid to them. Well back to my project to raise some plants from seed. The eight Lazer seedlings continued to grow and now all eight have produced sturdy little plants. Some have flower buds and others are on flower. There is one little niggle which is that some of the leaves have curled back and look distorted. I’m not really sure what has caused this to happen. I can’t see any mites on the leaves so I’ll ease up on watering. Anyway curling leaves or not I’m really pleased with the results and will try to keep these plants going so I can see whether they produce more flowers next year. After my success with these cyclamen I have to admit being slightly disappointed with the cyclamen coum. I have managed to get five seedlings from these plants and they are very slow to grow. I am not too concerned about the slow growth as these are hardy perennials and I had expected this but I sowed far more of these seeds and had expected them to germinate more easily. I based this reasoning on the fact that another hardy cyclamen - hederifolium self seeds all over our garden. I comes up in between paving and in any tiny cracks. See this post. Hederifolium produces flowers in autumn - around this time. The leaves come after the flowers. Flowers are produced over a few weeks. Once the cyclamen have been pollinated, the flower stem curls into a spring and sits on the ground amongst the leaves. The seed pods splits as the seeds ripen. Ants and other insects are attracted to the seeds as they are in effect sugar coated. They carry the seeds away and so scatter the seeds all over the garden. The original hederifolium plants in our garden were planted a long time ago and have often been dug up and moved around. Some of the tubers are now as big as dinner plates. I wondered whether our little cyclamen coum plants will ever achieve the same. Now what challenge shall I take on for next year? What about you? The bad weather and short days will soon descend on us. This means that those of us who spend lots of our spare time outside in the garden or on an allotment plot will need something else to distract us. 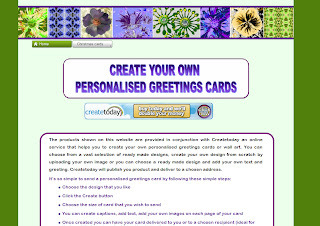 Like many of you, as well as gardening I love to take photographs, and I have accumulated quite a library of photos, so when I received an email from a lady called Julia asking whether I would be interested in submitting some images and designs to an online printing company called CreateToday I thought that I’d have a look. 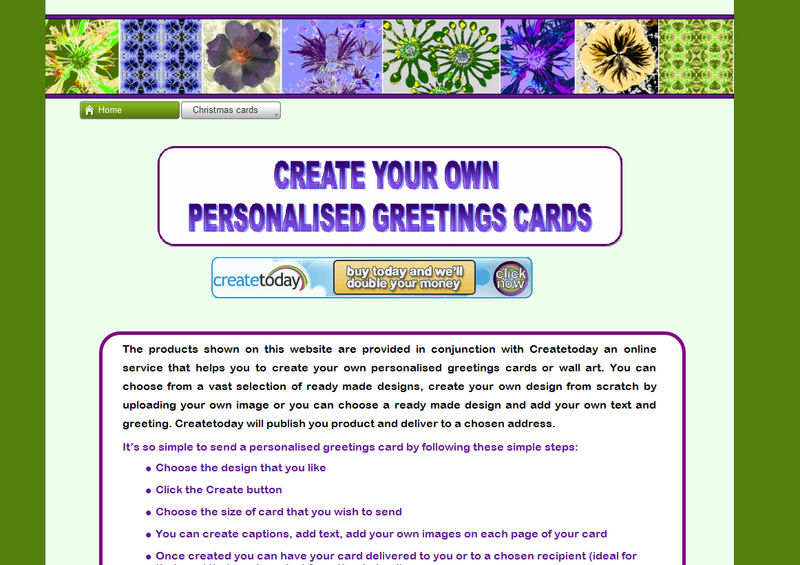 The company produces greetings cards and wall art products. There are lots of such companies out there and in the past I’ve acquired canvas wall art prints produced from a couple of my photos. The difference is that this company collects images from what they call artists but which basically means anyone who would like to submit images to an online portfolio. 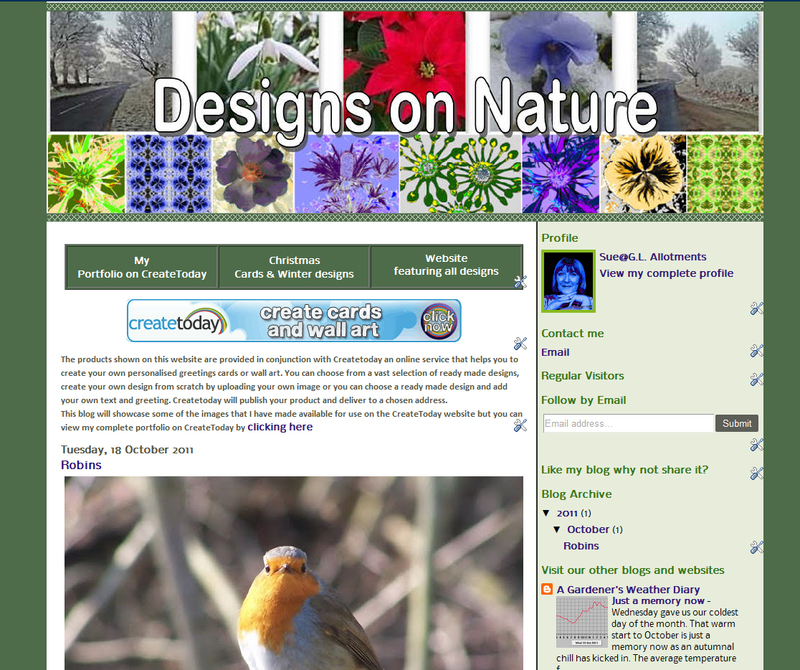 In return for using the images each ‘artist’ is given commission on any products bought that use their work. Anyway to cut a long story short I decided to give it a go. I enjoy messing about with photos and images and this project seemed to be an ideal way to give my 'messing about' a purpose (and I get to be called an artist!) If I actually manage to sell any of my images it will be the icing on the cake but is certainly not my main reason for this new project. I’ve set up another blog and website basically because this is another thing that I enjoy doing to link up with this new ‘hobby’’; have a look if you have a few minutes and are interested. A three pronged approach to planting garlic. Our attempts at growing garlic suffered a crop failure last year. The cloves were started in pots in the cold greenhouse and were doing well until they were planted out and then it was downhill all the way. I’ve since read that garlic needs plenty of water so I suppose the really dry spring and summer could have caused some of our problems. 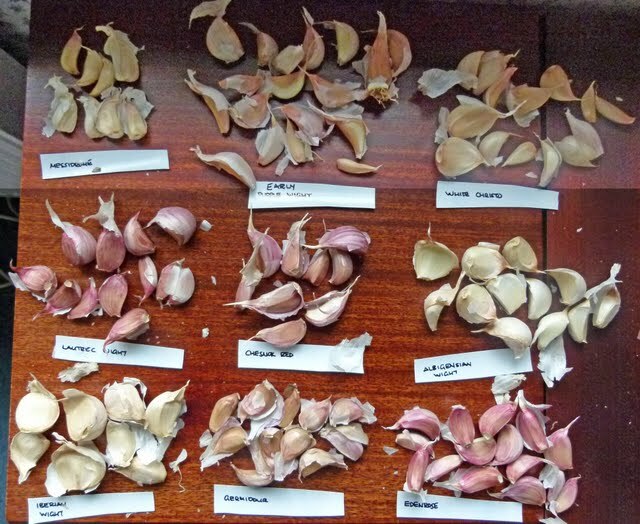 Whatever the reason next season we are going for broke and have bought a garlic collection. The number and size of the cloves of each variety vary considerably . We have both hard and soft neck varieties. The softneck don’t flower and are supposed to be better for storing. The hardneck varieties do flower - in fact when I split the bulbs there was the remains of a flower stalk in the middle of some of the bulbs - you need to pinch out any flower stems that develop so all the energy goes into bulb production. I’m going to try a three pronged approach to see which method of growing will work best for us. The first prong was to plant up 3 cloves of each variety into pots using multipurpose compost. Although garlic needs moisture it doesn’t like to be waterlogged so I’ve placed the garlic trays across the trays on the greenhouse staging to allow for drainage. Unlike onions the cloves are pushed beneath the surface of the compost. In spring the young garlic plants will be planted out on the plot to grow on. For the second prong I planted three of each variety, except the elephant garlic, into a tub. Garlic apparently are hungry feeders and these plants will stay in tubs until they - hopefully - are ready to harvest. For this reason I mixed together John Innes number 3, multi purpose compost and grit. The John Innes is to provide better nutrition and the grit to help with better drainage. I thought the elephant garlic needed more space to grow to maturity which is why I haven’t planted any cloves in the tubs. The tubs will stay in the greenhouse overwinter and be moved outside in spring. 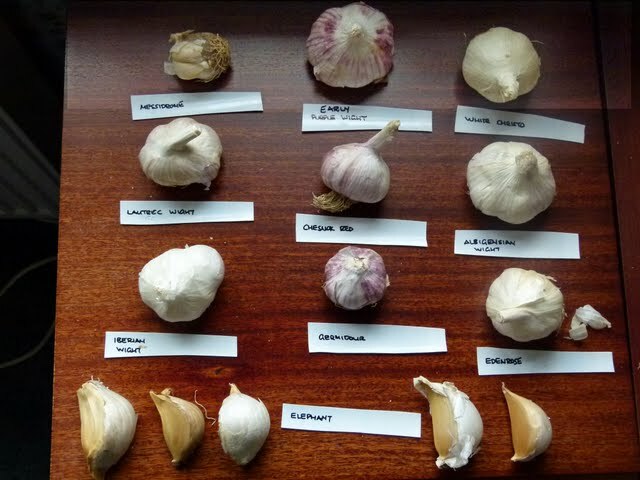 Garlic needs a period of cold temperatures in order to grow cloves otherwise it can grow just one fat bulb. Life in our greenhouse will be cold enough but being under cover will prevent waterlogging. The third and final prong was to plant some cloves straight into the ground. The cloves were planted in a shallow trench. Chicken manure pellets will provide some nutrients. Now I just have to hope one prong actually works and produces a harvest. If all the prongs work then all I can say is that the whole of Yorkshire (including Whitby) will be a vampire free zone! Once we are in October the chances are that a frost could descend on us at anytime and so I decided that I’d better gather in the squash fruits. Even discounting the possibility of squash being ruined by frost, October is a dangerous time for any squash or pumpkin fruits growing on allotments. Many fall victim to those who think pumpkins growing on someone’s plot is fair game. Many will end their days as footballs or have been ‘acquired’ for Halloween, carved and hollowed out. We grew two varieties of squash this year. We’ve grown Crown Prince for a few years and have always been pleased with our crop so that tends to be a staple. To this we added Autumn Crown which is a new variety bred especially for growing in the UK. It’s supposed to be a cross between Crown Prince and a butternut squash and is described as having a melony taste - we can’t confirm this as we haven’t tasted one yet. This year conditions have been far drier than squash like and even our Crown Prince vines have produced smaller fruits than normal. Some vines have not produced a fruit at all and others have only managed a single squash. The Autumn Crown fruits are much smaller than we expected - the name meant we expected something similar to Crown Prince. I’m not sure whether the smaller size is due to lack of rain or that this variety is naturally smaller. The vines that have produced the largest fruit were either growing under our sweet pea frame where the ground didn’t dry out as quickly. I supposed it was a sort of ‘two sisters’ set-up! I always cut the squash leaving them attached to a section of vine which not only acts as a sort of handle for carrying the fruit about but it is also supposed to make them less likely of rotting. 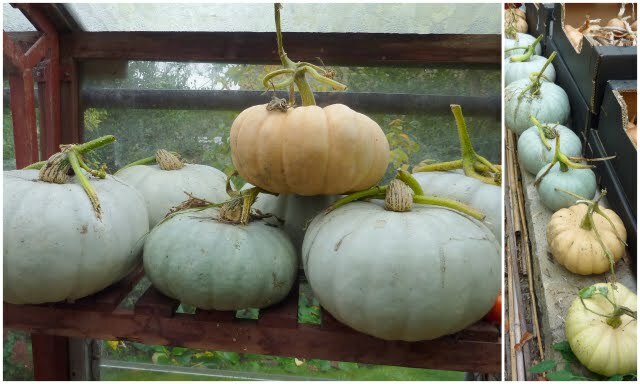 Anyway all our squash are now safely gathered in and being stored in our garden greenhouse where they will hopefully manage to survive Halloween - that is unless one ends up in the pot! The plant loves damp conditions so in many ways it was hardly surprising that it wasn't happy this year but to be honest it hasn't really performed for ages. Anyway I decided it was time to dig it up and see if it would enjoy life better in a pot that could be overwintered in the greenhouse. No wonder it was struggling the ground was like dust but despite this lots of small white shoots were trying their best to grow. In fact there were so many shoots crowding each other that the plant needed dividing into several clumps of varying sizes which were each potted into pots of varying sizes. After planting the pots were given a good soaking - you could almost hear the sigh of ecstasy from the plants. Some if not all the pots will be popped in the greenhouse over winter. I am also wondering whether to try popping at least one of them into the pond as a marginal - does anyone grow arums like this? Well ever since we picked the fruits we’ve been mulling over why our nectarines looked more like peaches. I checked the photo of Fantasia on Thompson and Morgan’s website and our ‘nectarines’ looked nothing like the ones shown. 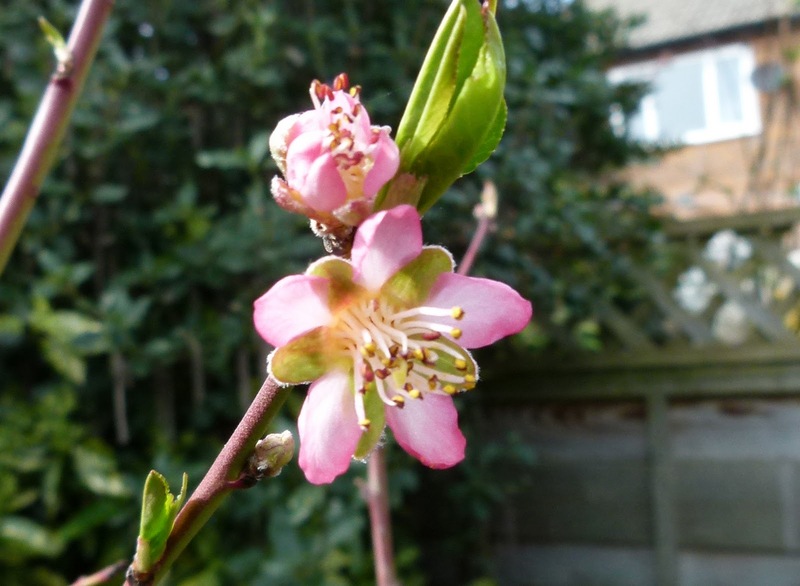 I checked the photos of nectarine flowers on the Internet and they sort of looked like the ones we had on our tree - but then again so did the photos of peach flowers. I thought maybe the photo on T&Ms web site wasn’t accurate but looking again our fruits did look very much more like the photos of the peaches on the same web page. Now don’t get me wrong if our nectarine turned out to be a peach then I’d be perfectly happy - we like both fruit but it just seemed that a nectarine would be a bit easier to grow in our part of the country. In the end I decided to email and send photos T&M to ask what they thought. Could the trees have been mixed up and if so what variety of peach had I ended up with? I didn’t complain just asked for their comments. A reply came straight back saying that it looked as though the tree that we were sent is a peach called Avalon Pride and what’s more they are going to send me a replacement nectarine next year. That’s without me asking or complaining so all in all I’m very happy and must give T&M a pat on the back for such good after sales service. I’d really like to try growing an apricot too but we need to think where we will put all these trees. They really must stay in the garden and in large pots where we can protect them from frost and also I think the fruit would just be too big a temptation to risk at the allotment. T&M have an apricot called called Flavourcot which sound good and one called Champion that only grows 1m tall, and supposed to be good for growing in a pot. Has anyone grown either? Regular visitors will be only too aware that we like to try growing something different - sometimes just to see if we can! 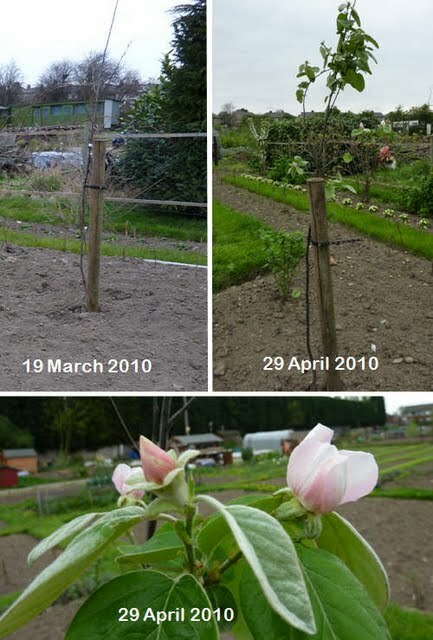 In March last year (2010) we planted a quince tree, The variety was Meeches Prolific which we chose as it was advertised to be a reliable cropper. 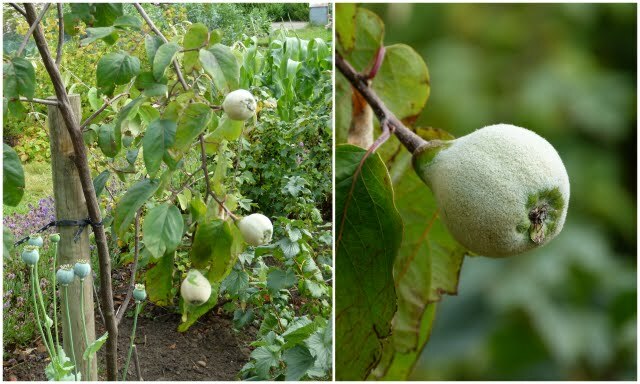 We had never eaten quince or even seen an edible fruiting quince growing so we didn’t really know what to expect. The only thing I really knew about quinces was that they were one of the foods eaten by The Owl and the Pussycat. 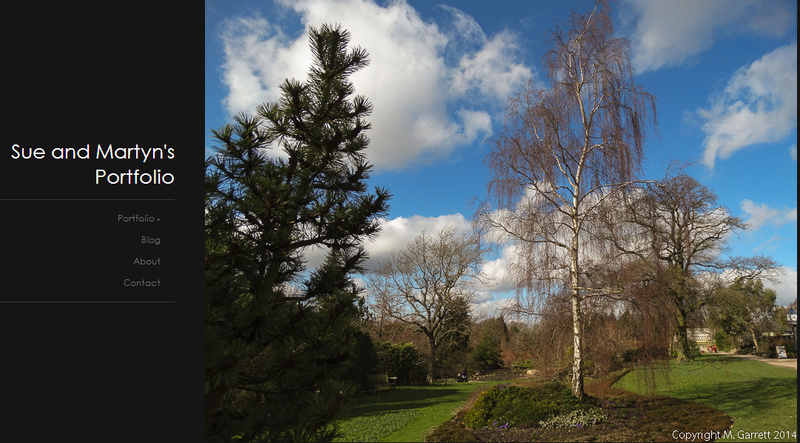 The tree arrived in January so was planted in a large pot and kept in our cold greenhouse until conditions improved. In mid-March it was planted out and by the end of April it had produced very attractive felt leaves and a few flowers. By the end of the season it had produced three fruits. Not knowing how or when to pick the fruits or how to tell if they were ripe the short story was that we didn’t actually get a taste. The tree over-wintered successfully and this April produced more flowers. The flowers are really lovely. 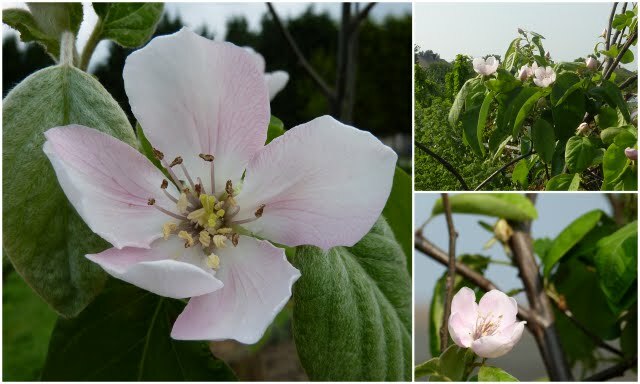 So much so that when we had to choose a photograph to print on canvas we chose a photo of a quince flower. In May it became obvious that quite a few fruits had set. The lovely leaves had been torn ragged by the wind and the tree and we had hardly any rain for three months so we were not counting our chickens. By June the tree carried several small fruits. These were pear shaped and had a pale green felty covering similar to that of a peach. Through July the fruits continued to swell - they were beginning to be heavy enough to make the branches weep - despite now only being given an occasional can full of water which could have hardly made up for the lack of any decent rain for five months. 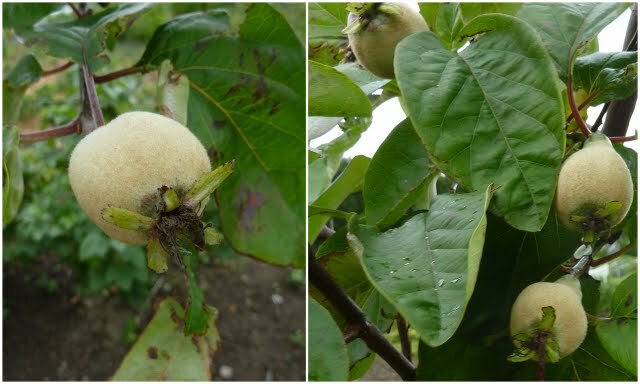 In August some fruits began to loose their felty covering although some fruits still had felty patches. The fruits were then turning a apple shade of green. 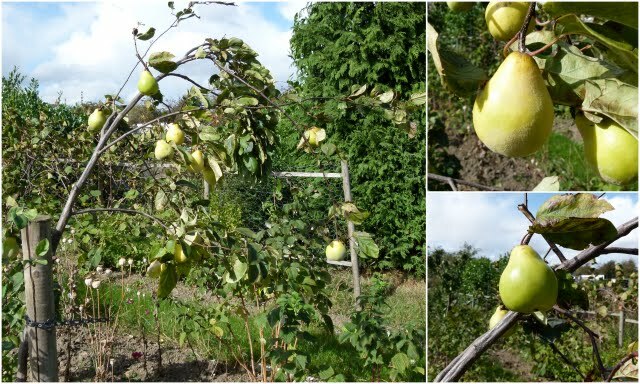 By September the fruits were the size of medium sized pears and turning yellow. This year we had read everything we could find about when to pick the fruits. Advice was to leave the fruits on the tree for as long as possible at least until October and to pick before the first frosts. Now that’s not as easy as it sounds - we had to try and judge when enough was enough. When was the risk of frost too great to leave the fruits on the tree. By early October some of the fruits were completely smooth and yellow which is a sign that they are ripe so we decided to pick a couple to try. Quinces are really hard fruits and can’t be eaten raw. So what do you do with quince other than making quince jelly which not really being jam eaters we wanted to avoid? A trawl of the Internet later we decided on an apple and quince crumble. We decided not to flavour with any spices so we could experience the true flavour of the quince. Everything I have read states that ripe quinces are fragrant and can taint any food stored alongside them so I was expecting some sort of perfume smell. As the quinces cooked they smelled of honey (not something reminiscent of a Dior concoction) and the cooked fruit tasted of honey too - well that’s as near a description as I can give. We loved it so the race was on to pick the rest of the fruits before the frosts ruined them. In all the tree produced fourteen fruits but I'm left with a huge problem. Does anyone know how to free my head from that stupid poem? I've posted an article about quince on my website here if you are interested. 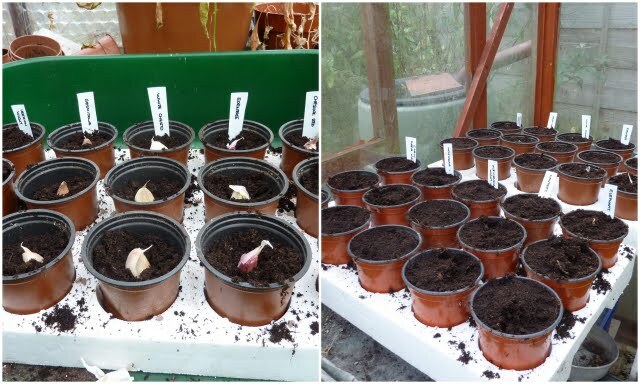 A few days ago I spent two days tidying up the onions and shallots that had been drying in our greenhouses - not ideal places to dry onions but with rain forecast (which didn’t really materialise), we didn’t have anywhere else where we could spread them to mature before preparing for storage. Anyway ideal or not what remained of the foliage had dried out and the outer skins of the onions had loosened so I set to removing all the loose foliage, snipping off the roots with a pair of scissors and trimming the tops. 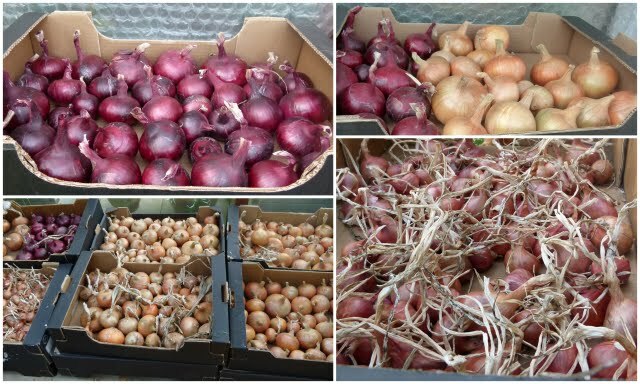 As each of the onions completed their beauty treatment they were graded into ones which had started to rot and needed throwing away, ones that were a little soft in places and needed using reasonably first and those that hopefully would store. The bulbs were then arranged in those boxes that supermarkets use to transport fruit. The boxes were then laid out in a single layer in the garden greenhouse. This way the air can circulate and also any onions that start to rot should be easily spotted. If things go according to plan they should keep us well supplied. After all that, you would think that I had seen enough onions for a while but no! 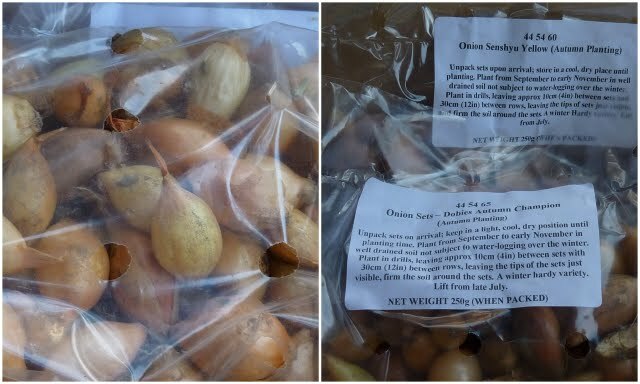 Immediately after I’d finished with this year’s harvest, the over-wintering onion sets arrived. We’d ordered four varieties, Electric (a red variety), Shakespeare, Senshyu Yellow and Autumn Champion. We are sharing the sets with a friend so we are each planting four different varieties instead of the usual two. As the sets had arrived we decided we ought to get them planted. The bed earmarked for them had a few small weeds so these were turned over using our mini tiller. Onion sets are notorious for jumping out of the soil. Birds are usually blamed for this but to be honest I’m not sure. I could understand that the birds may see the tiny dry neck of the onion set as possible nesting material in spring time but why would they bother pulling at a tiny bit of dry material at this time of year when they have more pressing needs - like food and water. I can’t imagine that any bird thinks of onions as a possible food source! I think it is more likely that if the onion sets are pushed into the soil that this creates a more solid area directly under the set. Then as the roots start to develop the set is pushed up out of the ground. So with this in mind, to plant the sets I dragged out four shallow trenches, one for each variety. A row of onion sets was placed in each trench and the soil pulled back into the trench just so a tiny bit of the set was peeking out. The soil was like dust and so if we don’t get any rain within the next few days we’ll have to water. Our garlic arrived at the same time so will need planting soon but that’s for another post! What do you do when you have enough pickled beetroot? There’s only so much beetroot that you can use in pickles and chutneys so at the moment I’m trying out recipes that make more use of beetroot as a vegetable or as a cookery ingredient. I’m not too keen on the earthy taste of beetroot - it can be a bit boring so I didn’t just want to bake the roots. I wanted to try something that would make the flavour more interesting. Looking through some recipes on the Internet it seemed that beetroot was often cooked with apples and onions. As we have plenty of both I decided to try create something that used these three ingredients and also stole some ingredients that I usually use in a recipe for braised red cabbage. The final recipe can be found here on my website - we liked it and will certainly cook it again. 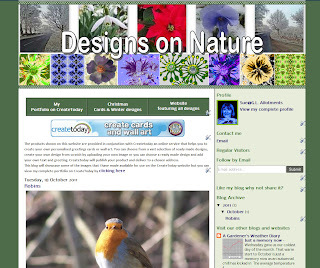 If you pop by my blog on a regular basis you will know that our back garden in going through a major upheaval and that at the moment there is very little happening on the creative side. The balance is unevenly tipped towards the digging up, chopping down and generally destructive side of things. The border that initially was just going to have the addition of a focal feature was just about completely cleared - just a couple of bamboos survived and only after me pleading their case. I last updated on how this area was progressing here. The crab apple which casts shade over this border has had branches removed - and is set to have even more taken out but other than the border is now ready to be replanted. We had already planted an acer and some clematis and now a start has been made by permanently siting the bird bath and planting around its base. I thought that the black leaved ophiopogon would provide a contrast to the white of the bird bath and so I have planted them at the front around the base. In front of them is planted laminum White Nancy which works well with the ophiopogon. I’ve taken a few cuttings so I can plant a carpet around the front of the bird bath as at the moment it is more to just one side. This was where it was originally planted and I didn’t want to disturb it. Nearer the back of the bird bath I have planted a couple of aspleniums which should love the damp conditions caused by splashing birds. In amongst the ophiopogon I intend to plant some miniature irises - Kathleen Hodgkins. The heucherella that can be seen on the left will be moved. The border still is rather bare with just one or two plants in temporary positions. Hopefully some of the plants will grow enough so that I can split them next year as I want more than one of each in the border to avoid it ending up looking dotty. Anyway at least I think I’ve made a start and one casualty of the big chop - a choisya is now sprouting really healthy new leaves - I wonder whether the camellia - just visible at the far end - will do the same? After having found out rather belatedly that my newly planted salvias may not over winter I decided to take some cuttings. For the cuttings I used a mix of half grit and half multipurpose compost. 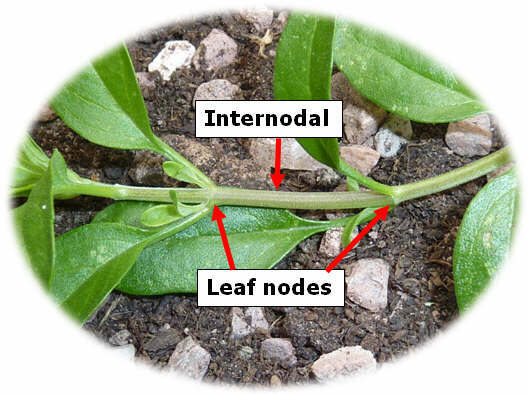 Unlike many cuttings that are taken below a leaf joint, salvia cuttings root best when you cut between two leaf joints; they are called internodal cuttings. As seems to be the currently preferred technique I placed the cuttings around the edge of the pot and then popped them under a propagator lid just to stop them drying out too quickly until they rooted. In no time at all, the Amistad salvia cuttings rooted and the roots quickly began to push through the holes in the bottom of the plant pot. These cuttings have now been potted up and the tops nipped out to encourage them to become bushy. They are growing away so now I just have to decide where to keep them overwinter. I’m not sure if the other salvias have rooted yet. There are no roots visible at the bottom of the pot and I don’t want to tip out the pot to see if any roots are beginning to form. I’ll just have to wait patiently and hope. These are a different type of salvia so I suppose they may take longer to form roots. Taking the salvia cuttings made me wonder what else I could try. I wanted more lavender to complete the edging around some of our fruit beds. I’ve successfully taken lavender cuttings in the past and so these were added to my list of cutting material. I’m also trying a few Michalemas daisy cuttings and some perennial nemesia which, if they are successful, along with some of the salvias will be used to fill in some gaps in one of our flower beds. 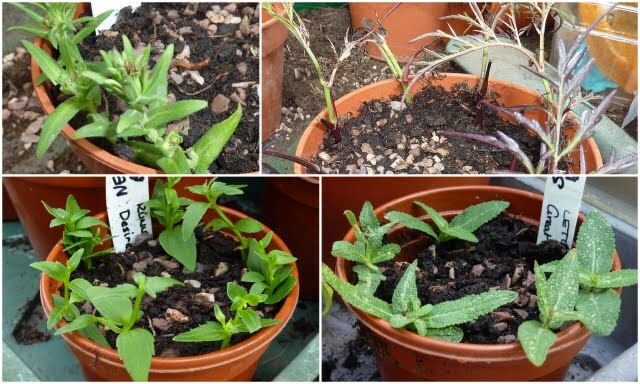 I was going to take some rudbeckia cuttings but noticed a few young plants growing around the base of our established clump and so have potted these instead. I’d like a sambucus nigra in the garden but don’t want it to grow as large as the ones on the plot so I decided to grow one in a tub and have taken some cuttings from the plants on the plot. I’ve been successful taking cuttings from this plant in the past - in fact our existing plants started life as cuttings. I’ve given away quite a few young plants so here’s hoping all goes well again. No doubt I’ll either end up with no rooted plants or too many! Another plant that I want to increase is Laminum - White Nancy. This didn’t look as though it would respond to the same method so instead I have pinned down some of the long stems to see it they will root in the ground so I can then detach them and pot them up. My last lot of plants for free are the potted runners taken from our new strawberry plants. I’ve taken 15 from each variety which is more than I bought originally. I intended to cut off all the runners produced in case they weakened the plants in their first year of growth. The plants, however had other ideas and I couldn’t keep up with the runner production. Some runners managed the start to root in spite of my best efforts and so it seemed a shame not to pot them on. At least I’ll have some young plants to replace any winter casualties and if the main plants make it through winter? Well you can’t have too many strawberries can you? It will just be a case of finding somewhere to plant them!